A friend of mine just had to fix thousands of dollars in water damage after finding out her refrigerator had been leaking for a year. As a relatively new homeowner, this is my nightmare scenario—the problems I can’t see and remain blissfully ignorant of until they become giant expensive problems that I can’t miss. WallyHome is a network of moisture sensors that you can stash all over your home, where they’ll immediately alert you to problems like leaks, mold, or abnormal temperature and humidity levels. After I set up sensors in my bathroom, kitchen, laundry room, and even the attic, I could rest easier knowing I’d be notified—and thoroughly. When I simulated a leaky bathroom sink, I got a push notification, an email, and a text message, and WallyHome even followed up with an “all clear” email once I’d cleaned everything up. The problem with sensors is that they need power. No one’s gonna want to put a moisture sensor in their attic if they have to then remember to climb up there and swap out the battery every so often. Jeremy and Jacquelyn Jaech, the founders of SNUPI Technologies and creators of WallyHome, came up with a new communications platform they call SNUPI, for Sensor Network Utilizing Powerline Infrastructure. The battery in each sensor node should last for years and years. The watch batteries in the wireless sensors are guaranteed to last 10 years, because they aren’t transmitting data all the way back to WallyHome’s hub. Instead, the system uses your home’s existing electrical wires as an antenna. Each sensor only has to transmit data as far as the wiring in your walls, so the signal transmitter doesn’t need a lot of power, and the batteries can last longer—plus, one WallyHome hub can cover your whole house, even if parts of it aren’t covered by Wi-Fi. WallyHome's app walks you through the (really quite simple) setup process for each sensor. Click to enlarge. When you tell the app where you’ll be putting a sensor, it even displays an animation that shows you exactly where it should go: under the water-intake hose on the back of my washing machine, for example. 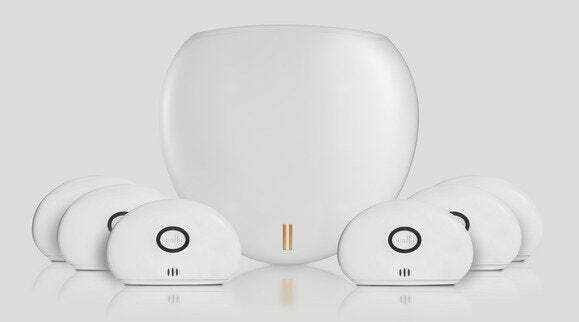 Since WallyHome’s unique signals don’t use Wi-Fi or mimic any other wireless communication that’s already happening in your house, the devices identify each other with no muss and no fuss. I was up and running in no time. Inside the app, you can monitor more than one property, in case you have a vacation home you’d like to monitor. (You’d just need one hub in each house.) The sensors send their data to the cloud, where it’s analyzed, and the app shows graphs of the temperature and humidity readouts for each sensor. If your sensors detect conditions outside a specific range, you’ll get a notification. The notifications tell you exactly what's up. Sensors in your attic can lead to notifications that you need better ventilation, or that you should consider adding more insulation. It’s all the stuff I would want to know as a new, mostly clueless homeowner. And if I owned a home I was renting to someone else, WallyHome’s data and notifications would be priceless. Machine learning even lets WallyHome predict the growth of mold. As CEO Jeremy Jaech explained, while there are tons of different kinds of molds, most are predictable if you know enough about the temperature, moisutre and humidity, and the surface, over a long enough period of time. WallyHome doesn’t know about the surface, so it assumes the worst there, and uses its data and algorithms to fill in the rest. The system can keep track of how long conditions remain favorable for mold growth, and give you a nudge when you’re in the danger zone. Everything seems fine at my house, thank heaven, so aside from my simulated leak, the only WallyHome notification I got was when the signal was lost from the sensor hidden under my bathroom toilet. The bathroom actually sticks out from the side of the house a little, and the toilet is in the far end, so maybe it’s just far enough away from the wires to make a difference. The notification advised me to rotate the sensor or move it slightly, or even stand it up on its end, and when none of those would keep the sensor online, it was easy to reassign that sensor to a new spot in the house. Water damage, freezing, and mold add up to billions of dollars of insurance claims each year, and having an early warning system can save not just money but heartache. WallyHome’s useful notifications come without any monthly monitoring fees, and the system is easy to set up. It would be nice to not have to keep the hub tethered to a router by Ethernet, but the convenience of not having to charge or change the sensors’ batteries makes up for it. WallyHome offers simple leak detection, without the hassles of keeping sensor batteries charged or struggling through a complicated setup process. Super easy to set up. One hub covers any size house. Sensors don't need batteries changed for years. Hub needs to be plugged in to Ethernet.